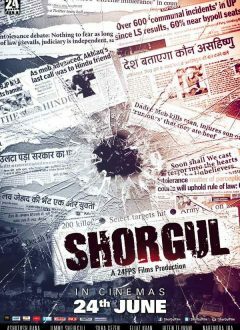 Shorgul is a Political Drama, based on real life incidents that rocked the Nation with headlining news in the past. The film is set on the backdrop of Uttar Pradesh bringing to light sensitive subjects that have occurred in our country. In addition brings out some controversial Political Mind Games & Master strokes of high profile dignitaries. In the Movie, an Innocent Friendship between a Hindu boy and a Muslim girl rapidly escalates into a political minefield, causing unrest and chaos in the state. The matter snowballs in an interesting series of events and takes an unexpected turn, becoming a national issue in question.